fender precision bass 70’s MIJ. Mid 2000’s. Added Duncan 1/4 pickups. Bass is in excellent shape aside from some light scratches on the back. Has P and J active pickups with 3 band eq. Lots of punch and low end. Comes with hard shell case. Purchased this new in 1996 which is Fenders 50th anniversary year. Still have the original tags, paperwork and accessories that are included. Three-band EQ with treble, mid and bass boost/cut; active/passive switch. Double cutaway 4-string electric bass. Precision Bass®. Basic Gig bag available, but not a Fender. Specs from FENDER SITE on this guitar follow. 2007 Fender American P Bass. Includes hardshell case, paperwork and truss rod tool. Bass has been used with care and is in great condition. Upgraded Seymour Duncan Basslines Pickup, Baddass Bass III Bridge and Dunlop Straplocks (strap is included). Slight scuffing and a small nick on the bottom (in photo) and some minor small marks on the headstock (also in photos), these are only visible upon close inspection. Case is in good condition, it’s a little dusty and scuffed but fully functional, all hinges are intact, etc. Sold as is, returns are not accepted. Thanks for looking. 1978 Fender Precision Electric Bass Guitar Natural finish. 1978 Fender Standard Precision Electric Bass Guitar.Natural Finish. Very good condition . Pictures are of this bass! Plays nice and smooth. Doesn't include a case. Shipped free with FedEx, insured. 4.5 out of 5 stars - 1978 Fender Precision Electric Bass Guitar Natural finish. 8 product ratings8 product ratings - 1978 Fender Precision Electric Bass Guitar Natural finish. Condition is Used. B l a c k w i t h b l a c k p i c k g u a r d. O n e t u n e r i s a b i t b e n t a n d f u n c t i o n s 1 0 0 % t h e r e are a f e w c h i p s I t r i e d t o c a p t u r e i n the pic s.
Body wood - Alder with Ash veneered top and back. Neck - Graphite Reinforced Maple. I am sure you will love this neck, it is the best Fender Precision bass neck I have felt. Why buy a new Fender when this Fender is in such good condition and available at a used price. This is a Great Bass! Fender Standard Precision Electric Bass Guitar. Rarely used and is in near new condition. Approx 46.5"x13". Made in Mexico, S/N MX15671422. Trending at $712.50eBay determines this price through a machine learned model of the product's sale prices within the last 90 days. Its sleek Precision Bass form features the sonically powerful combination of a punchy Fender®-designed split single-coil Precision Bass middle pickup and a growling single-coil Jazz Bass bridge pickup with ceramic magnets. Squier Affinity Bronco Electric Bass Guitar. Condition is Used. Shipped with USPS Priority Mail. Squier Affinity Series Precision Bass PJ - Olympic White w/ Indian Laurel Fingerboard. The Squier Affinity Series Precision Bass PJ puts classic Fender P Bass tone and feel into your hands at an amazing price. Throughout the 1950s, the Precision Bass was the only Fender bass, and this model gives you the design from later that decade that has been the world's most recognized electric bass guitar form ever since. Model #0146102384. Body: Alder. Since its early-'50s introduction, the Fender® Precision Bass® guitar has remained the world standard for thick tone and smooth playability. Truss Rods: Standard. Truss Rod Wrench: 3/16" Hex (Allen). 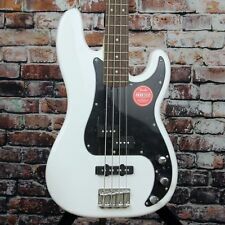 Fender Player Precision Bass Pau Ferro Fingerboard Polar White bought from guitar center San Francisco in 2017. Includes all extra's still sealed in case and plastic film on pick guard. Without the Fender Precision Bass, the original electric bass, dance floors everywhere would be empty. Bone nut; 20 narrow-tall frets for familiar playing feel. ’63 P Bass neck profile. Hardshell case. We wish for your guitar to arrive in the most excellent condition possible and ready to play out of the box! Body Material: Alder. Fingerboard: Maple, 9.5” Radius (241 mm). There’s nothing more classic than a Fender electric bass, and the Player Precision Bass is as authentic as it gets—genuine Fender style and the rumbling, seismic sound that spawned a thousand imitations. Excellent condition Precision bass.Best Fender Precision Bass era.All original, no issues with this one.OHSC is included. Thanks for watching!! Killer player and not too heavy for this era:9 lbs, 11 oz. Fender American Elite Maple Fingerboard Precision Bass Tobacco Sunburst. Condition is Used. Shipped with FedEx Ground or FedEx Home Delivery. • Body: Alder. • Fingerboard: Maple. • Truss Rod: Standard. • Fingerboard Radius: 9.5"" (241 mm). • Truss Rod Wrench: 3/16"" Hex (Allen). • Neck Material: Maple. • Body Shape: Precision Bass. • Middle Pickup: Yosemite™ Split Single-Coil Precision Bass. Fender Precision Bass Original clean condition. does have a push button tone. I believe it gives a. This is in Beautiful Condition. This is a Made in USA Bass. but could happen again. the bass is great, but is sold as is as stated. THE P BASS WEIGHS 8.4 LBS! Without the Fender Precision Bass, the original electric bass, dance floors everywhere would be empty. ’63 P Bass neck profile. Precision Bass®. Fender Part # 019-3610-706. V-Mod Split Single-Coil Precision Bass®. THE STANDARD IN PRECISION STYLE Combining traditional design with contemporary features, the Standard Precision Bass is an elegant and affordable classic designed for the bassist who appreciates great style, rich and muscular tone, and excellent value. • UPC: 885978724369. • Body: Alder. Without the Fender Precision Bass, the original electric bass, dance floors everywhere would be empty. The -golden '63 P Bass neck profile feels just right nestled in your hand, becoming one with you, while the narrow-tall frets provide a familiar playing feel and perfect intonation. Neck: Rounded maple neck with black dot inlays. Frets are in great shape with hardly any wear. 1 5/8" nut width; 34" scale length. Neck is straight & truss rod works fine. Neck stamp dates to '79. Fender Standard Precision Bass 4-string Electric Bass - 0146102532 - Brown Sunburst. Truss Rod Nut: 3/16" Hex Nut. Since its birth in the early '50s, the Fender Precision Bass guitar has remained the ubiquitous standard for thick tone and smooth playability. Condition is used but excellent. Jazz Bass pickup in rear. Very small (arm) wear spot on upper edge of body. • UPC: 717669377892. • Body: Alder. • Color: Honey Blonde. • Fingerboard: Maple. • Neck Material: 1-Piece Maple. • Body Shape: Precision Bass®. • Number of Frets: 20. • Fingerboard Radius: 7.25" (184.1 mm). • UPC: 717669369828. • Body: Alder. • Color: 2-Color Sunburst. • Fingerboard: Maple. • Neck Material: 1-Piece Maple. • Body Shape: Precision Bass®. • String Nut: Synthetic Bone. • Neck Finish: Gloss Urethane. Best Offer, let's deal! 1976 Fender Precision Bass guitar. Very hard to find fretless model! Has been modified by adding a Sullivan Active Jazz pickup above the bridge and a 9v battery box to the back of the body. The modification was done professionally and looks as if it could be original. Cosmetically, this guitar is in really good shape for its age. Minor blemishes on the body and headstock but overall this guitar is a real looker. Comes with the well worn hard case shown, not sure if it is original. Ships within 24 hours of payment. Alder body with gloss finish. There’s nothing more classic than a Fender electric bass, and the Player Precision Bass is as authentic as it gets—genuine Fender style and the rumbling, seismic sound that spawned a thousand imitations. Fender Precision Bass American Special Hand Stained (new). Condition is New. Shipped with USPS Parcel Select Ground or UPS Ground. Ships only to continental US. Condition is New. Stunning and unique P bass. Solid Swamp Ash Warmoth P bass body with contoured belly, forearm and heel. Custom stained. I used a white base stain then mixed it with a deep red stain. Fender Hard shell case is included. · We operate in Ocean County, New Jersey. (Natural Finish). You can rest assured that your order will make it there in one piece. Neck is straight with great action and no signs of bowing. Precision Bass middle pickup paired with Noiseless™ N3 single-coil Jazz Bass bridge pickup. Maple neck with modern profile and contoured neck heel. Active/passive mini-toggle switch. _gsrx_vers_625 (GS 6.9.7 (625)). Guitar with hard case. LOCAL PICK UP Good working condition with normal signs of use. We tried to do this but using only water. Fully tested and ready to work. What's included?. Fender Player Precision Bass, Maple Fingerboard - Black. Body: Alder. Fingerboard: Maple. Fingerboard Radius: 9.5" (241 mm). Truss Rods: Standard. Truss Rod Wrench: 3/16" Hex (Allen). There’s nothing more classic than a Fender electric bass, and the Player Precision Bass is as authentic as it gets—genuine Fender style and the rumbling, seismic sound that spawned a thousand imitations.